Subscribe to our Newsletter mailing list - about 1 message per month. Rogaines are organised and run totally by volunteers. Check out the Events and Volunteers page for where you can help out, then simply register or email the Volunteer Coordinator. Thinking of entering an event or helping out at one? Interested in photos and reports of past events? Go to the Events section. Who are we? Can I become a member? Go to the NSWRA section. What happens when you get there. What happens on the course. Wondering what all this is about? Have a listen to Joel Mackay explaining it to Simon Marnie on 702 ABC Sydney's "Weekends". The 2019 Autumngaine offers 6 and 12 Hour events in the Mountains and plateau woodland with open understory for easy walking. A two and a half hour drive from Sydney, on the western side of the Blue Mountains, the course offers great rogaining and navigational challenges to suit your ability, on an excellent map produced from recent LIDAR data sets. Choose from 6 Hour or 12 Hour events, starting at 11.00am. Have dinner and relax afterwards with friends. Camp for the night. Have breakfast and then leave for home after a challenging and rewarding weekend. The course, based in Springwood and stretching between Faulconbridge and Blaxland, will contain everything the Blue Mountains is famous for – rainforest, lookouts, caves and other interesting rock formations, and waterfalls (indeed, Springwood was named for the many water springs in the area). For teams that want to spend the bulk of their time in the bush, this course will not disappoint with its great variety of tracks and route options, but as is usual with urban-based events, a large amount of effort has gone into ensuring there will be some checkpoints in interesting parklands and urban areas so families can make a nice day out as well. What a great way to start off the year of rogaining. Our first event of 2019 is the, now traditional, 3 hour minigaine which will be held in the Western Sydney Parklands. More details about the event will follow shortly, but it's time to start training for this event which is only 9 weeks after Christmas. This is a three hour event, so you can enter it alone, or with a team of up to 5 people. We are running the Series Point Score again this year with one rule change. Two points will be given for each hour of the event duration you have entered. For example, if you enter the NSW Championship (traditionally a 24 hour event) your score will be your teams % of the median team's score multiplied by 100 plus 48 points. In 2018 it was actually easier to get a good score in the shorter events. The reality of rogaining is that really competitive teams gravitate towards the longer events and this makes the median score relatively higher. So if you were chasing a good score to bolster your rankings you greatly improved your chances of doing well by entering the shorter event where two events were on offer. The added duration points will level the playing field. Your best 3 events this calendar year will contribute to your overall point score. The points you earn for each event are calculated by taking your team’s score expressed as a % of the overall median score for that event (ignoring category). There will be the usual categories as per the rules of rogaining (no junior category, only under 23). For the purpose of this point score, you're only up against others6 in the category that is defined by your age and gender (i.e. A men's super veteran will not also compete in the open men's category, which is different to our usual rules for event). A volunteer at an event will be awarded their average score for that year. Two points will be added to your score for each hour of the event duration you have entered. Click here to be taken to the Orienteering NSW Homepage. Orienteering is a great way to hone your rogaining skills. Rogainers with smart phones are encouraged to install the following app on their smart phones and carry them during events. 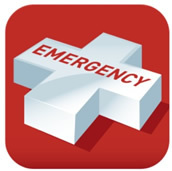 This Emergency+ app has been developed for Australia’s Triple Zero Awareness Working Group. When activated, the app displays current GPS coordinates. This knowledge could be very useful in a variety of rescue and support situations. No mobile coverage is required to display GPS coordinates. The app is available in the app stores for Android, Apple and Windows devices. 112 is the GSM international standard emergency number which can only be dialled on a digital mobile phone (Some international model phones cannot dial "000"). 106 is the text-based emergency number for people who are deaf, or who have a hearing or speech impairment. This service operates using a textphone (TTY) or a computer with modem access.